Give the gift that keeps on poking. One of my favorite toys of all time has finally been inducted into the Toy Hall of Fame. The stick. Young and old alike can appreciate the simple joy in using a stick for hours at a time. 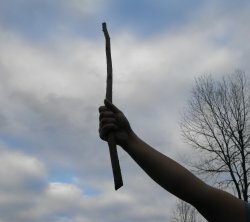 Just the other day I used a stick to scratch my back, and then it made the perfect material for starting a fire in the wood stove. It's a well known fact that once a toy becomes popular it all of a sudden becomes one of the most difficult things to find. That's why I've decided to make available some of our fine sticks to ease the shopping crunch. For 20 dollars I will send you a bundle of 50 sticks of various sizes that are sure to fit most folks on your shopping list. Shipping is included and I will even throw in a short length of string. Add an extra 5 bucks if you would like them gift wrapped.